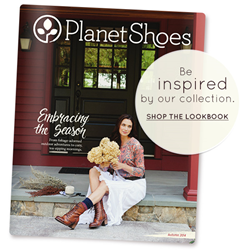 PlanetShoes releases their fall magalog, filled with the best and brightest riding boots, flats, booties and casual sneakers. “Featuring a specially selected variety of our favorite brands and styles from shoes to bags and accessories, this may be our best lookbook yet," said Phil Meynard, President of Planet, Inc.
PlanetShoes, a lifestyle retailer committed to helping people live healthier, more eco-friendly lives, is pleased to announce the release of their Autumn Lookbook for 2014. The 24-page magalog features some of PlanetShoes’ best brands, styles, shoes and accessories in an impeccable layout. The stunning photography highlights PlanetShoes’ most unique pieces for fall, including embellished booties, cozy slippers, and of-the-moment color trends like burgundy, cobalt and grey. Other featured trends for Fall 2014 include leather riding boots and waterproof wonders as well as boots adorned with buckles, metals and artistic detailing. Beloved brands such as Fly London, Merrell, Jambu, Clarks, Pistil and Dansko make welcome appearances throughout the immaculately assembled spreads. This is PlanetShoes’ third lookbook to date, the first released in Fall 2013 and the second in Spring 2013. PlanetShoes carries a wide variety of women’s, men’s and kid’s shoes, bags and accessories, only a handful of which were featured in this season’s lookbook.